Digital advertising in the U.S. accounted for $42.6 billion in revenue in 2013, an increase of 16% over 2012, according to the financial analysis firm eMarketer. But while that digital ad pie is growing, the numbers show that news organizations are competing for an increasingly smaller share of those dollars. While Google’s recent announcement of a 26% increase in ad volume in the first quarter of 2014 disappointed Wall Street investors who thought the number might be higher, it highlights the problem for the journalism business. Big tech companies that largely aren’t in the business of creating news content continue to dominate the digital ad space, often because they are able to reach much larger audiences than news organizations can. In the first quarter of 2014, Google earned 90% of its revenue from digital advertising, and the ads that appear around Google search results remain its main source of that revenue. But display ads—which include banner ads and video ads that are increasingly critical to newsrooms’ revenue—are a growing part of Google’s ad business. Google and other large tech companies are able to place display ads across a large network of websites and can target that advertising more effectively than a single website (or news organization) can. Even so, news organizations need digital ad dollars as their legacy advertising revenue shrinks. New numbers from the Newspaper Association of America show that daily and Sunday print ad revenues in the newspaper industry fell another 8.6% in 2013. Yet digital advertising among newspapers last year grew at only 1.5%, too slowly to balance out the print losses. The association reports that digital ad revenue now represents 19% of overall newspaper ad revenue. 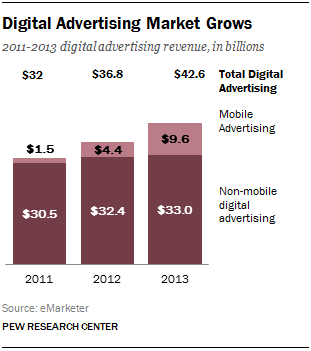 In 2013, overall digital display advertising accounted for $17.7 billion, up from $14.8 in 2012. But five major technology companies—Facebook, Google, Yahoo, Microsoft and AOL—accounted for 51% of that nearly $18 billion in revenue in 2013. That share is up substantially from 38% in 2009 and it edged up slightly from 2012 (50%). Facebook has sprinted past Google to become the biggest player in the digital display ad market, bringing in $3.17 billion in revenue in 2013 compared with $2.99 billion for Google. As recently as 2009, Facebook controlled only 7% of the digital display market. A main source of digital ad revenue for news is banner advertising, a sub-category of display ads. Banner ads, the image or text boxes that surround web content, make up 23% of all digital ad revenue. In 2013, banner ads accounted for $9.6 billion in digital ad sales, up 12% from 2012. eMarketer does not provide a breakout of the digital ad revenue by company, but news outlets face stiff competition from large tech companies for banner ad dollars. Digital video ads, another subset of the overall digital display market, accounted for $4.15 billion in sales in 2013. 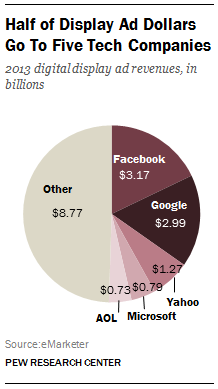 This is up from $2.89 billion in 2012, a 43.5% change. While eMarketer has not tracked the percentage of digital video ad dollars collected by major tech companies, a separate study of YouTube showed that the video sharing service owned by Google accounted for 20.5% of all digital video advertising revenue in the U.S. in 2013. Mobile advertising more than doubled from 2012 ($4.4 billion) to 2013 ($9.6 billion). And mobile display advertising — which news organizations hope to tap into — grew from $1.9 billion in 2012 to $4.3 billion in 2013. A Pew Research Center survey found that 51% of smartphone owners and 56% of tablet owners reported getting news on those devices in 2012. The bad news for news, however, is that nearly three quarters (73%) of those mobile display dollars are collected by five companies—Facebook, Google, Pandora, Twitter and Apple. And their share of that pie grew from 64% in 2012. Indeed, in April 2014 there were media reports that Facebook would soon make a major move in the mobile ad space by unveiling a new mobile ad network.